So, like everyone, you’ve got hopes and dreams about what, you want to achieve in life. But how do you make those hopes and dreams become real? 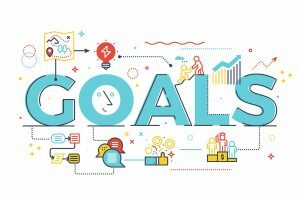 The answer is by defining and setting goals and here is a set of criteria that can help you reach those goals. 1. Define your goal and write it down. A goal which isn’t written down basically doesn’t exist – well, it exists in your mind and as such, is really not much more than a vague dream. You can say that dreams do sometimes come true, but if you truly want your goals to become true you need to take action. So, step one: Write it down! It is important to understand that a positive attitude is essential for goal setting. The goals we set cannot truly resonate with our minds if we only define them in terms of what we should and shouldn’t do. Statements like “Don’t be shy when you meet new people” or “Stop eating so much junk food” are terrible examples of good goal setting – they are only negative reinforcements of bad habits that we think we should change. They are no more helpful than a shopping list full of things you don’t need to buy. Pretty much pointless, isn’t it? Think about goals like ” Be more confident” or “Eat fresh and healthy food”. Firstly, they simply sound much better, but far more importantly, they clearly define where we want to be – what the end result is that we want to achieve. Include precise amounts, dates and so on in your goals so that you have specific things that you can mark as “done” on your to-do list. Avoid vague language, like ” try to do my best” because there is really no way to know whether you have been successful or not. Without a way to measure your success, you miss out on the celebration that comes with knowing you have actually achieved something. Any precise amount can be a perfect measurement tool – whether it’s kilometers, numbers, grades, dates or money. Imagine trying to measure a goal like “Do more sports this year”. It would be very difficult to measure our progress and celebrate our successes. However, if we change it to ” Go to four taekwondo classes a week” we have a very clear way of measuring our success. This does NOT mean that every goal must be limited to a materialistic set of measurements. For example, the goal “Be happier and live in harmony with my inner self” can also have a clear set of measurements to help you achieve this state of mind. For example: ” Write daily in a gratitude journal,- Practice Meditation/Freewriting/Yoga every day, -Make presents for friends or strangers, -Read a book”. A great measurement tool in this context can also be deadlines: “Run a half marathon in October” or “Read a book every week”. Don’t forget about this tool, we all know the power of deadlines. I believe you’re an outstanding and unique human being, but If you set a goal that you have no hope of achieving, you will only demoralize yourself and erode your confidence – dooming yourself to unending frustration. Make sure that it really is possible to achieve the goals you set. Merely saying, don’t try to finish the whole cake in one bite! Breaking the final vision into a concrete set of actions is an important step which places us in charge and transforms any ambitious goal into manageable, bite-size pieces of the cake! 5. Does this goal belong to you? Now that I’ve mentioned the word “motivation”, let’s take a closer look at the definition of motivation, what does this word actually mean? Definition 2: “Internal and external factors that stimulate desire and energy in people to be continually interested and committed to a job, role or subject, or to make an effort to attain a goal-“. Business dictionary. So mainly a lack of motivation is either a lack of importance or a lack of energy. Ask yourself, “If I were to share my goal with others, what would I tell them to convince them it was a worthwhile goal?” Just write it down, it may help you when u start doubt on yourself or lose confidence in your ability to actually make the goal happen. 6. Imagine yourself in the situation when you have reached your goal. How do you feel? What surrounds you? What changes can you see? This step helps you to place your goal in your comfort zone and your subconscious will get used to it, as well as keeping you on track during those moments when you’re almost ready to give up. 7. Love what you’re doing and let your inner universe change this world for the better!